A graphic illustration of the RCS calculation setup. 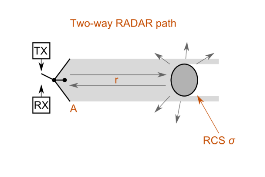 The Radar Cross Section (RCS) of an object is its effective area intercepting the incident power density, which when scattered isotropically would result in the received backscatter power. The estimation assumes that the polarisations are matched. This calculator returns the Radar Cross Section (RCS) of an object, given a number of input objectives. A graphic illustration is shown above. The simplified equation used in this calculator to determine the RCS of an object, given the frequency, received power, transmitted power, total path distance and antenna aperture area is shown below. Simplified equation used calculate RCS. An antenna is an object with a unique RCS characteristic, since part of the power received is delivered to the antenna terminals. A good impedance match to the signal will reduce the re-radiation, and hence the RCS.